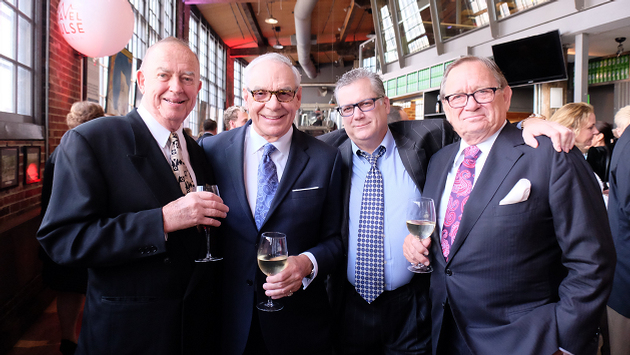 Pat Brigham of Sunquest, second from left, was inducted into the Canadian Travel Hall of Fame at the TravelPulse Canada Readers' Choice Awards on Thursday night. Thursday night's TravelPulse Canada Readers' Choice Awards was a great chance for friends to catch up. 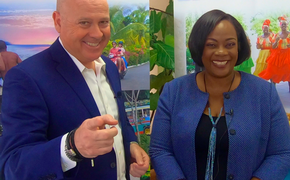 Among those on hand were newly appointed Air Canada Rouge president Duncan Bureau, Jane Clementino and Lyell Farquharson of WestJet, Michael Curmi of Porter Airlines, Moise Levy of Softvoyage, Hall of Fame inductee Vicki Borenstein and Philip Rose of the Jamaica Tourist Board. TravelPulse Canada Editor John Kirk was the emcee of the show, and TravelPulse President/CEO Mark Murphy flew in from the U.S. for the occasion. Johnny Fay, drummer for the iconic Canadian band The Tragically Hip, was on hand to sign bottles of The Hip's red wine, which was served during the event. 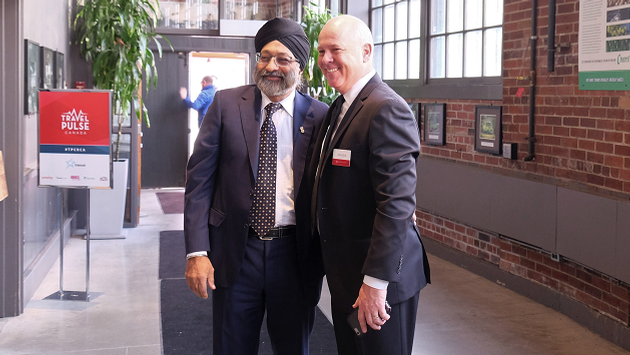 TravelPulse Canada Editor John Kirk greets Surjit Babra at Thursday night's Readers' Choice Awards gala in Toronto. On a perfect, summer-like night in downtown Toronto, arriving guests were given a specially made cocktail for the night, The Hall of Fame-ito, with rum, cranberry, lime, mint and other goodies. Appetizers included Vietnamese Spring Rolls, Wagyu Sliders, Sesame Crusted Tuna, Chicken Tostada and other world favourites. Comedian Ron James was the entertainment for the evening and had the crowd in stitches for a half-hour performance, taking on everyone from Justin Trudeau to Doug Ford, Tim Hortons and the Toronto Maple Leafs. Celebrity chef Lynn Crawford, one of the top names in Canadian cuisine, helped make some of the food, including a wonderful chopped salad with kale, cabbage, quinoa, tomatoes and more. Mains were short rib and beef tenderloin duos, and gnocchi primavera, with a summery lemon pound cake for dessert. 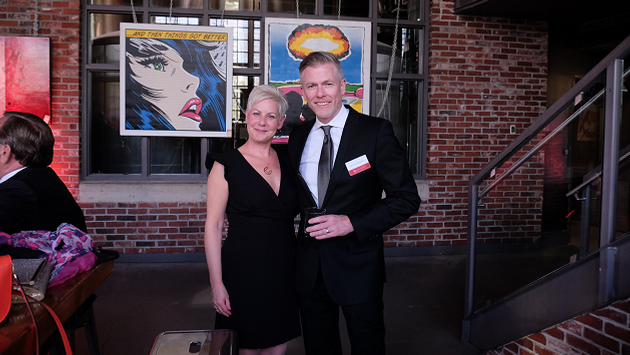 Former Transat Vice President Denise Heffrom with Travel Pulse President/CEO Mark Murphy at Thursday night's TravelPulse Canada's Readers' Choice Awards. 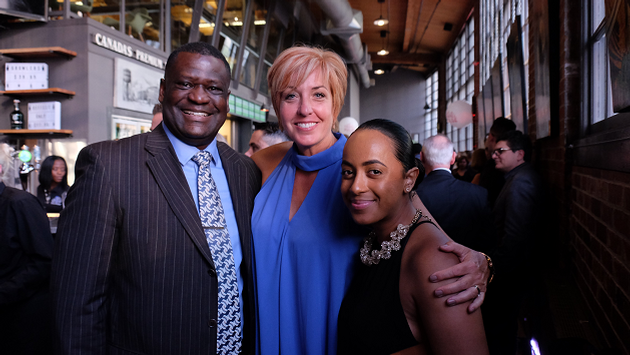 The night also included induction ceremonies for six Canadian travel giants. Announced as the first members of the Canadian Travel Hall of Fame were Jean-Marc Eustache of Air Transat, Last Minute Club founder Vicki Borenstein, Sunquest founder Pat Brigham, Sunwing president Colin Hunter, Moise Levy of Softvoyage and Angus Kinnear from Canada 3000. Your dedicated TravelPulse Canada team is doing its best to recover from a great evening, so we’ll leave it at that for now. Enjoy your long weekend, and be sure to check our site on Tuesday of next week for more photos and a list of ALL the big winners. And be on the lookout in the coming months for details on next year’s show. It promises to be bigger and even better, and you won’t want to miss it.